Golden Frog received many votes on Golden Frog Ideas for a Kill Switch feature in the VyprVPN desktop apps. After months of hard work, they have announced Kill Switch is available in VyprVPN for Windows and Mac! 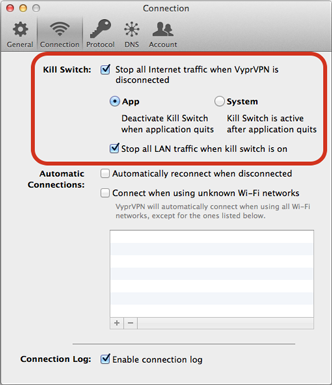 Kill Switch is a feature that users can enable to automatically "kill" or block their Internet connection whenever VyprVPN is disconnected. Except for network communications related to running VyprVPN services, Kill Switch will block all other Internet and network communication. Some users mistakenly connect to the Internet without enabling their VPN. Sometimes they don't realize their VPN has disconnected. In both cases, users are unknowingly exposing their personal data. Kill Switch ensures you never connect to the Internet without VPN protection. Golden Frog made it easy to enable Kill Switch at the application or system level based on your security preferences. Application Level - Kill Switch will only function when you are logged in to VyprVPN. System Level - Kill Switch will function even after you exit VyprVPN. You can also configure Kill Switch to allow or block LAN traffic depending on how much security you need. Continue to submit and vote for the features you want! Golden Frog loves hearing ideas from Giganews members and want to hear what VyprVPN features you'd like to see next. Like Kill Switch, they will continue to provide new features requested by Giganews members. Leave your feedback on Golden Frog Ideas. To stay up to date, please subscribe to our blog and follow us on Facebook, Twitter, our YouTube Channel, and Giganews Google+.